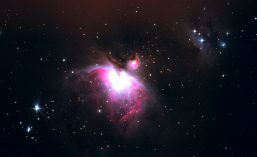 There are a great many different ways to take a photograph of astronomical objects. 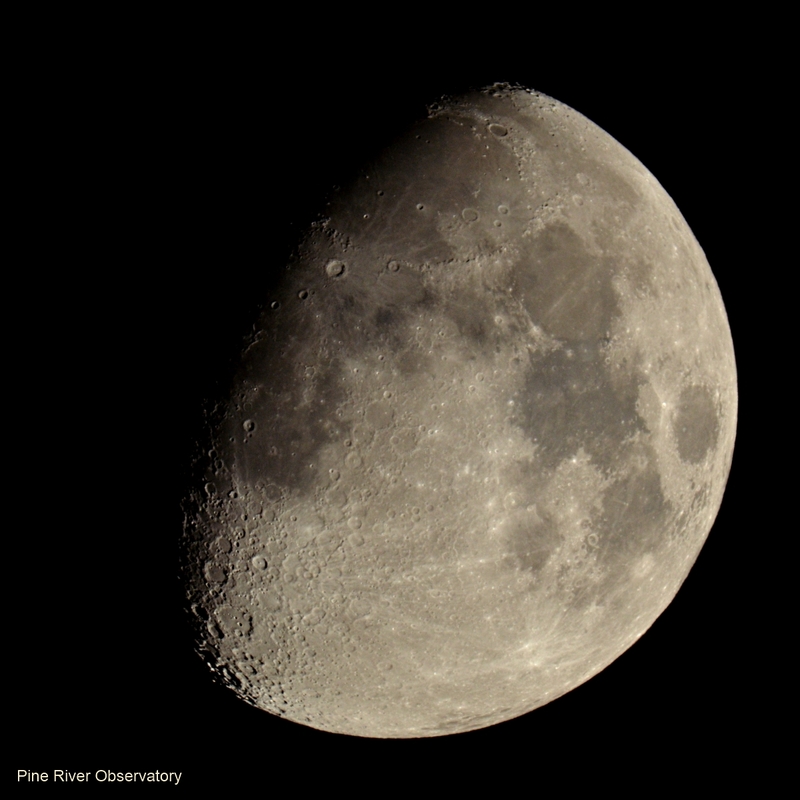 If you are looking through a telescope at a bright object like the moon, it’s possible to take satisfying photos “on the fly” without even having to attach a camera to anything. It’s called afocal photography. It’s very well suited to public or “sidewalk” astronomy events where nearly everyone visiting will have their own camera of some sort. Afocal photography is the process of shooting a photo with a camera simply by lining the camera up to the telescope (or microscope, or spotting scope, where this technique is sometimes called digiscoping) eyepiece. It does not require attaching the camera to the eyepiece (although there are ways of attaching the camera that makes things much easier. This post is about just trying it hand-held). There’s a nice introduction to afocal photography on Wikipedia (https://en.wikipedia.org/wiki/Afocal_photography). I thought a demonstration might be fun, using a very ubiquitous and simple digital camera, that built into an iPhone 3GS. If you want to try this with any camera more advanced than that on an iPhone 3Gs, please make sure that you turn the flash off! 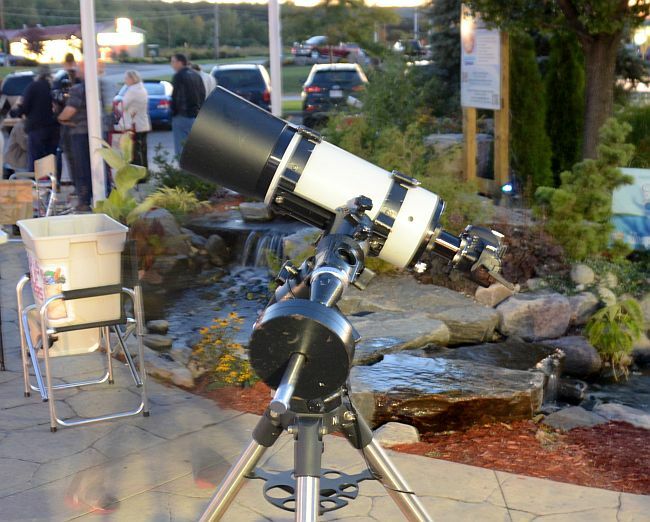 On the evening of Saturday 14 September 2013 the Hamilton Amateur Astronomers (http://www.amateurastronomy.org) presented a public astronomy evening in the parking area of a visitor centre in Grimsby, Ontario. I went along with my little Meade 125mm Maksutov-Cassegrain telescope, an iPhone 3Gs, and also a Nikon D5100 body. I thought it might be nice to compare two photo methods: afocal (putting the iPhone over the telescope eyepiece) and prime focus (replacing the eyepiece with the camera all together) photography of the moon. 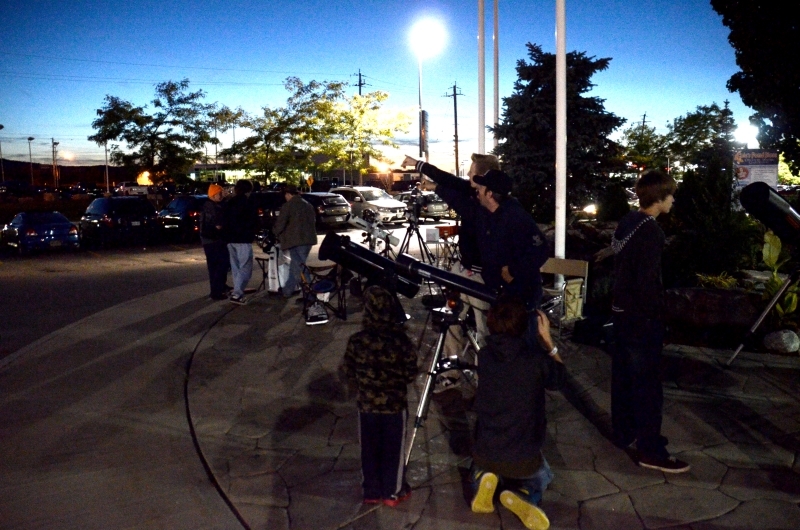 A public observing night put on by the Hamilton Amateur Astronomers on the evening of 14 September 2013 in Grimsby, Ontario. These events are terrific fun and a chance to see many different types of home telescopes in operation. After setting up my telescope I was happy to have lots of members of the public come by and take a look at the moon through a wide-angle eyepiece. The Meade telescope has a focal length of 1,900 mm. With a wide-angle eyepiece of 28 mm focal length, the combination had a magnification of 67x (magnification, or “power,” in telescopes is calculated by the ration of the focal length of the tube divided by the focal length of the eyepiece). My Meade Terabeam (TB) 125mm telescope set up for photography of the moon at the Grimsby public astronomy event. This compact little telescope is very versatile. In between looks through the telescope, I held the iPhone’s camera over the eyepiece as “flat” as possible – in line with the long axis of the eyepiece, pretty much up against the rubber eye cup. Once I could see the bright light of the moon showing up on the iPhone screen, I moved the phone carefully around a few mm at a time until more and more of the moon showed up. 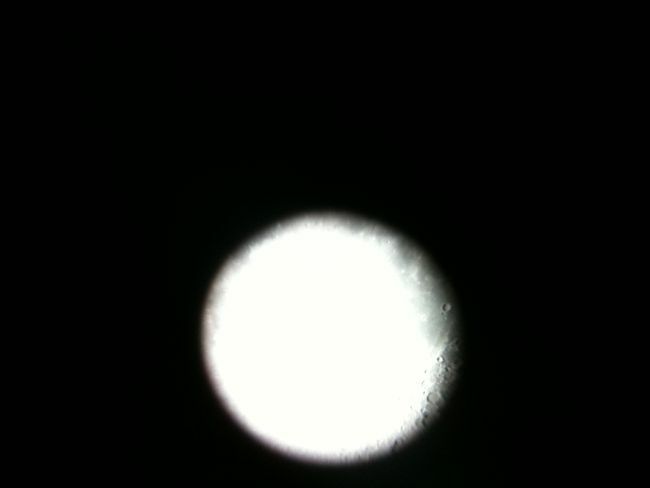 A first afocal exposure of the moon taken with the camera built into an iPhone 3Gs. At least one crater is visible – a good, if humble, start! It takes a little time and patience to line up the camera over the eyepiece, but in a few minutes I got the hang of it and started taking photos. Getting closer! Nearly the whole moon is visible in this afocal shot, one of many taken to ensure a good one is captured. After about a dozen images recorded, I captured one that I thought was pretty good. A pretty satisfying image of the moon, one of about a dozen tried. Hand-held afocal photography is very much a trial-and-error process. Some shops actually carry devices to hold cameras of various kinds (including cellphones) up against telescope or spotting scope eyepieces. These would be really helpful, especially if you wanted to take video or longer exposures. As it was, in this case I used the default camera app on the iPhone, allowing the camera and phone software to control exposure and focus. The afocal image above, rotated, and flipped left-for-right. I’ve also adjusted the brightness, contrast, and sharpness very slightly. 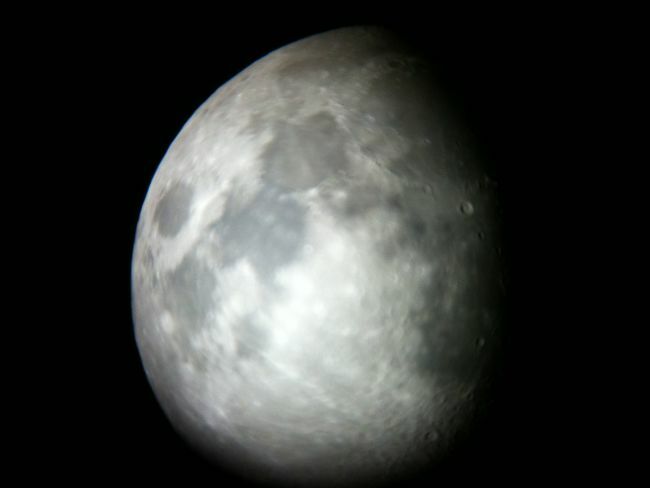 This compares very well to the image of the moon taken with a Nikon D5100 dSLR body at prime focus, below. After taking a photo I was satisfied with, I put the iPhone away and set up the Nikon dSLR on the telescope, at prime focus. This is the place where the telescope makes its basic image without an eyepiece. With this 1,900 mm telescope image of the waning gibbous moon, about two or three days past first quarter, just barely fit onto the APS-C sized sensor on the Nikon D5100. I had to rotate the camera to get it onto the sensor. A photo of the moon taken a few minutes after the afocal iPhone images, by placing a Nikon D5100 dSLR body onto the same telescope at prime focus (replacing the eyepiece with the camera). The iPhone afocal image compares pretty well with that from the dSLR once both are reduced down to the same size of image. The dSLR image is more detailed than the iPhone photo taken on the 14th, in part because of the much bigger (16 megapixel) sensor on the Nikon, and in part because of the wide-angle eyepiece used. Put side by side, sections of the images at their original resolution give a good idea of difference in resolution. 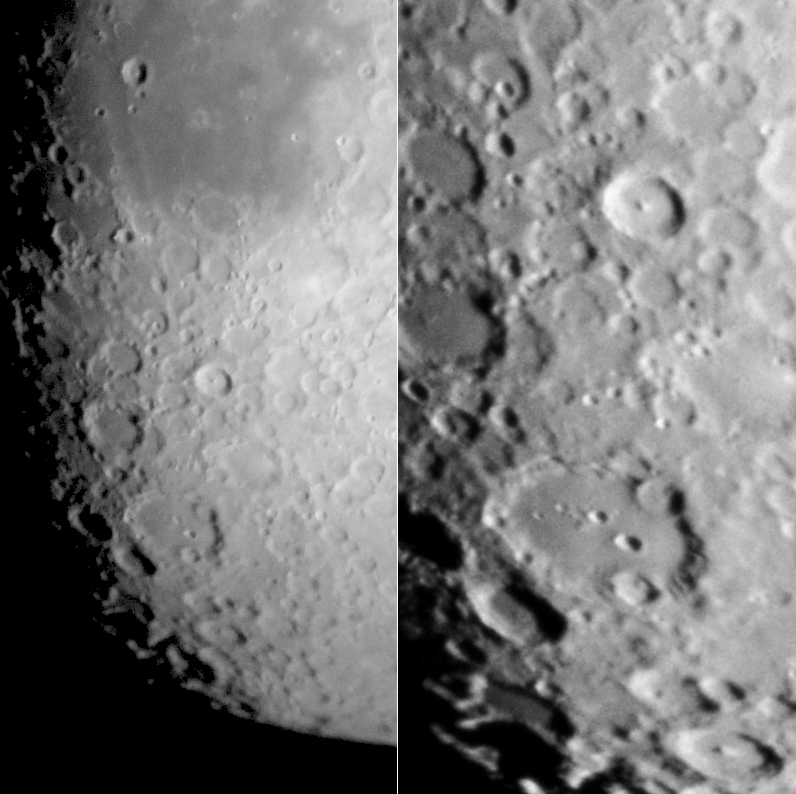 The southern part of the moon imaged with iPhone afocal photography (left) and with a Nikon D5100 at prime focus (right). Both images were converted to black and white, and then a strip 400 pixels wide by 800 pixels high was cropped out of each. The two images here are presented in their original resolutions for comparison. the large round crater with two smaller ones along its edge, toward the bottom of both images, is Clavius. The smaller, circular crater to the north, with a prominent central peak, is Tycho. Afocal photography is a “quick and dirty” method, but it’s also a lot of fun. One effect you might notice with this method is chromatic aberration, even if you are using a telescope that is an apo-chromat or a reflector that is not itself subject to this problem. It may show up, even on focused images, as colour ghost images or fringes. As I noted at the beginning, this process is particularly well-suited for public astronomy nights. Nearly everyone (well, lots of people, anyway) has a cell phone or pocket camera with them these days. 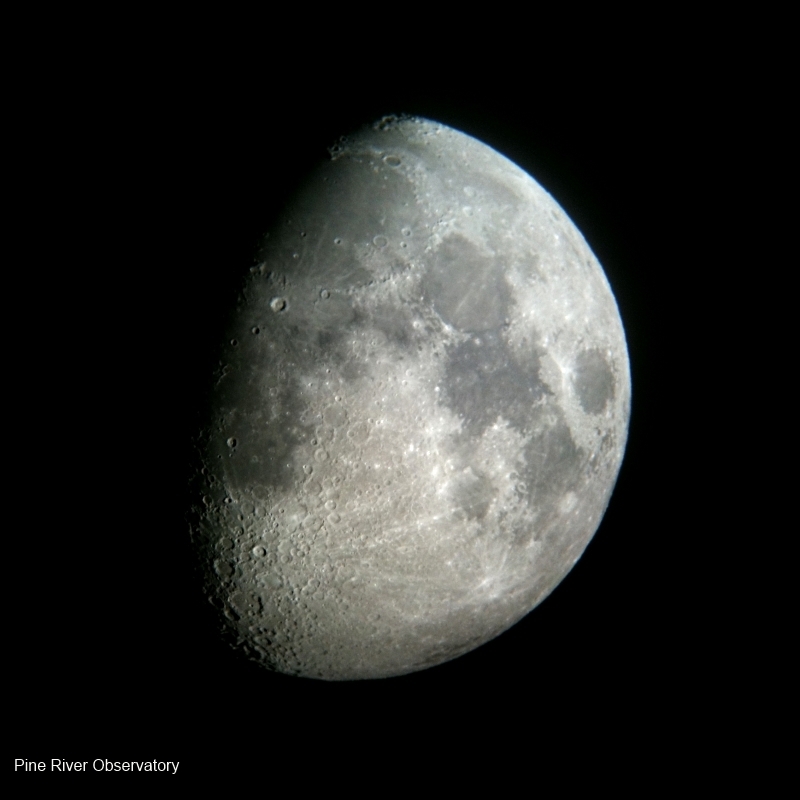 If you are inviting the public to try looking through a telescope at something bright like the moon, ask them if they’d like to try to make their own souvenir of the event, too – their own photo of the moon, on their own camera. 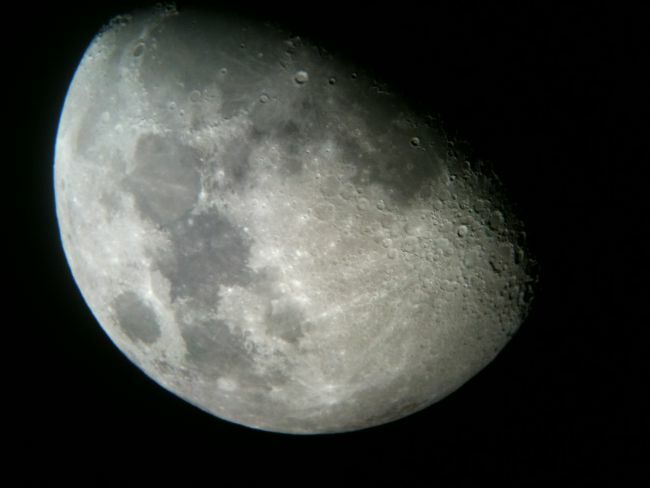 A few of our guests in Grimsby took away their own photos through my telescope, and they were pretty excited. I’m sure these were sent to a bunch of their fiends by SMS before too many more minutes had passed.